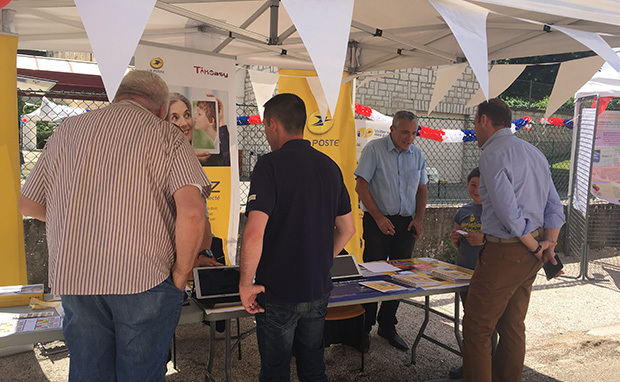 On 2 June in Fleurey-sur-Ouche, MP Didier Martin hosted the “district one party”, titled “Place de la République”, with elected officials from the department in attendance. La Poste was there, too. There was an initial report: Three pre-sales of the La Poste Mobile router, four sales of Red Cross stamp books, 12 sales of tracked letter stickers, 17 advance personal online account memberships (La Poste Account), ten pre-sales of the Ardoiz, and three pre-sales of the VSMP (“Watch Over My Parents”) service. 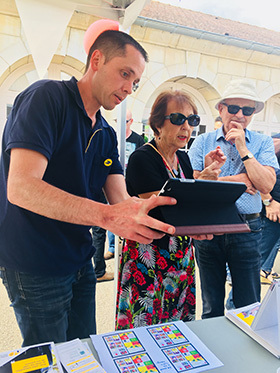 This was also an opportunity to meet organisations and present them with La Banque Postale's “Rue des associations” (organisation street) and the laposte.net account, as well as to speak with elected officials and local policy-makers about health and preventive measures challenges surrounding ageing.